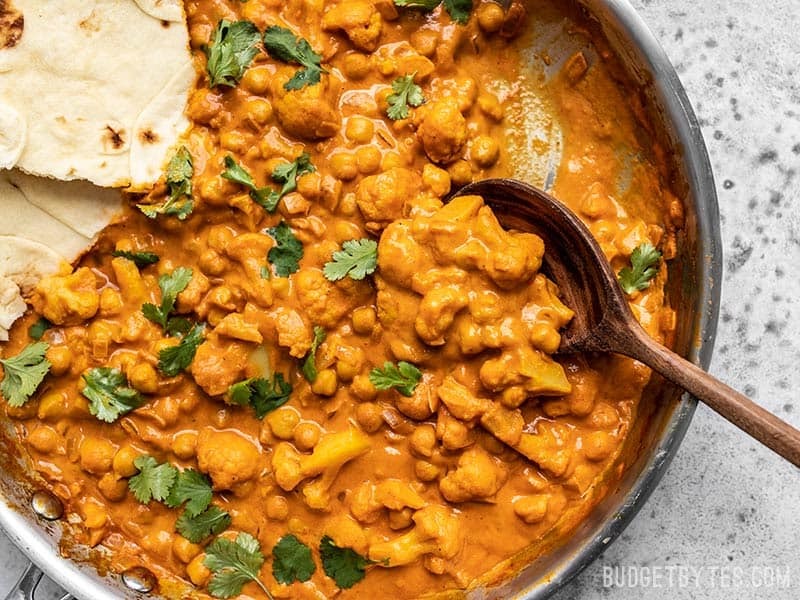 I’ve been eating my Cauliflower and Chickpea Masala with a piece of naan bread to scoop up that delicious sauce, but this dish would be equally as good over a bed of hot rice. 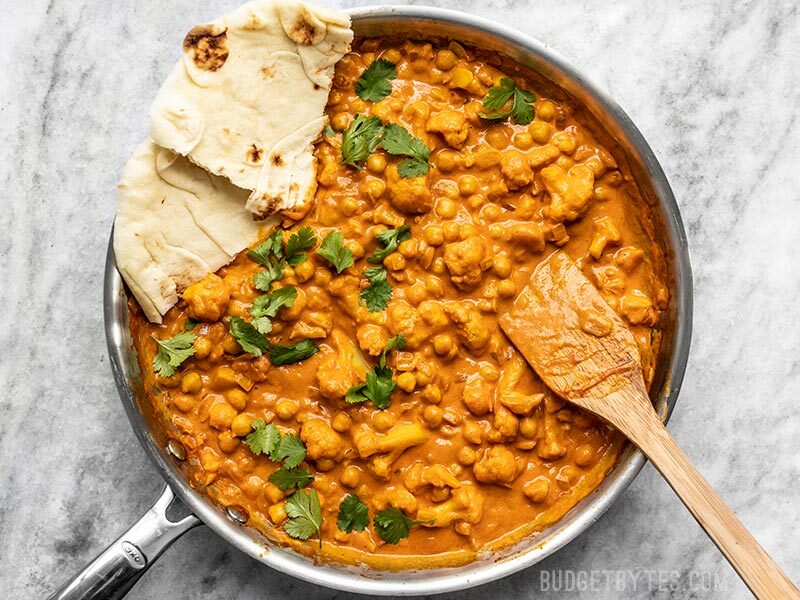 Either way it’s creamy, spicy, and oh so delish! You can adjust the heat of this sauce by increasing, decreasing, or even eliminating the amount of cayenne pepper in the spice mix. The amount listed below creates what I would call a “medium” spice level, but that’s extremely subjective, so take that with a grain of salt. 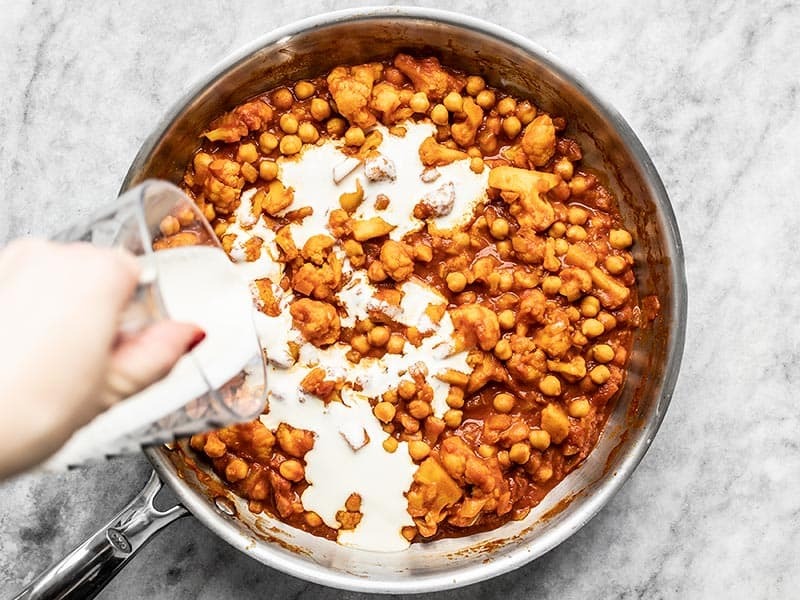 An easy sub for the heavy cream in this recipe would be full fat coconut milk (the stuff that comes in cans, NOT the dairy milk substitute). You can play around with the quantities, but I’d guess somewhere between 1/2 to 1 cup would work well. 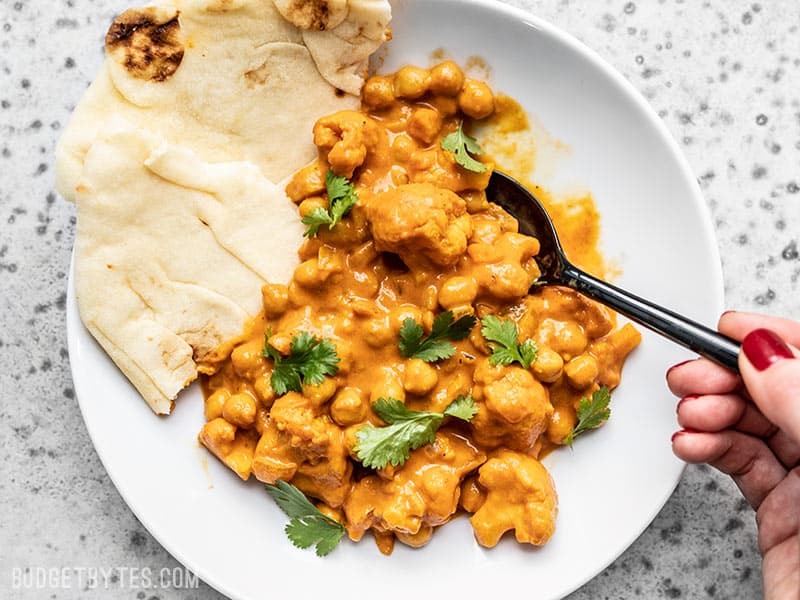 This super easy, ultra creamy, and heavily spiced Cauliflower and Chickpea Masala will be your new favorite weeknight dinner! So much flavor, so little effort. 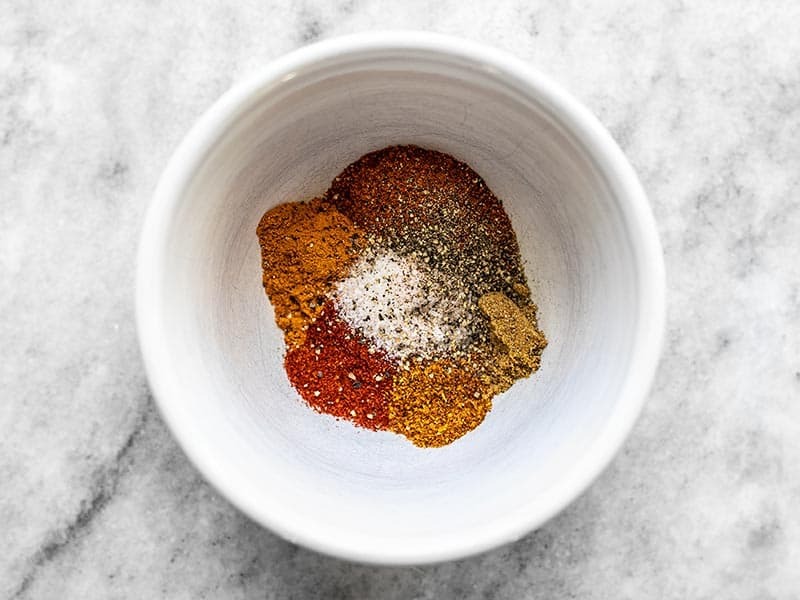 In a small bowl, combine the spices for the masala spice mix (garam masala, cumin, turmeric, smoked paprika, cayenne, salt, and pepper). Finely dice the onion, mince the garlic, and grate the ginger. Add all three to a large skillet along with the olive oil and sauté over medium heat until the onions are soft and translucent (about 3 minutes). Add the spice mix and continue to sauté for one more minute. 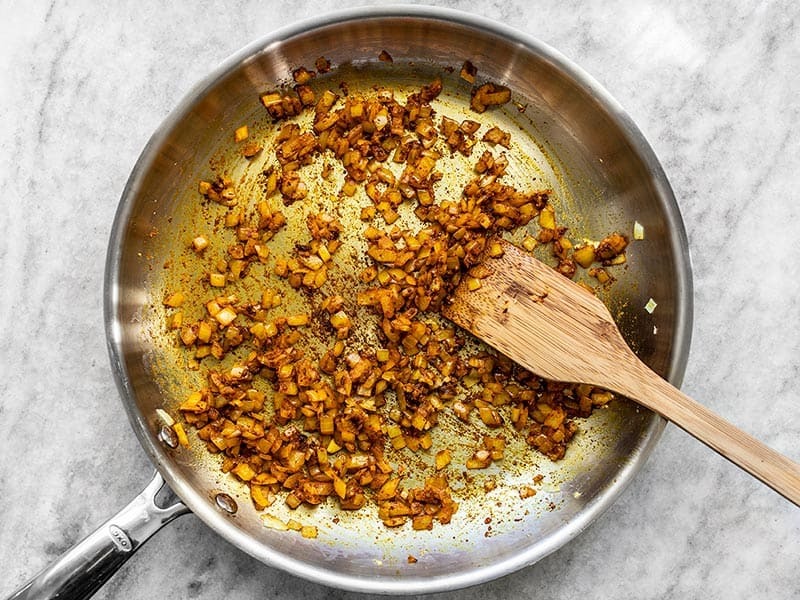 Add the frozen cauliflower florets to the skillet with the aromatics and spices, and continue to sauté for about 5 minutes more, or until the cauliflower have thawed through and are completely coated in spices. 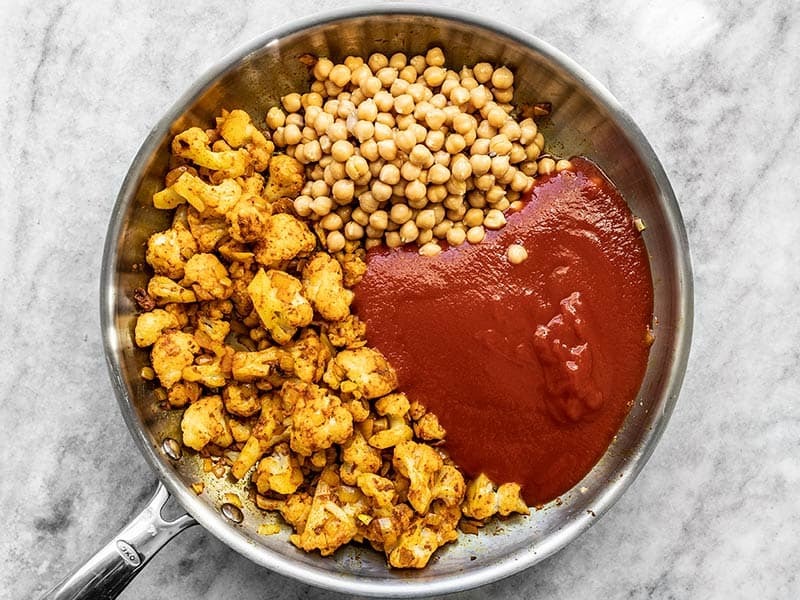 Add the drained chickpeas, tomato sauce, and 1/4 cup water to the skillet. Stir to combine, then allow them to simmer over medium-low heat, stirring occasionally, for about 15 minutes. This will help mellow the acidity of the tomato sauce and allow the spices to blend. If the mixture becomes too dry as it simmers, add a couple more tablespoons of water. After the sauce has simmered for 15 minutes, turn off the heat and stir in the heavy cream. Give the masala a taste and add salt as needed. Serve in a bowl either over rice or with a piece of bread for dipping. *For those living outside the United States, our "tomato sauce" is puréed cooked tomatoes with a little salt and sometimes a scant amount of onion powder. The closest product to this would probably be passata. 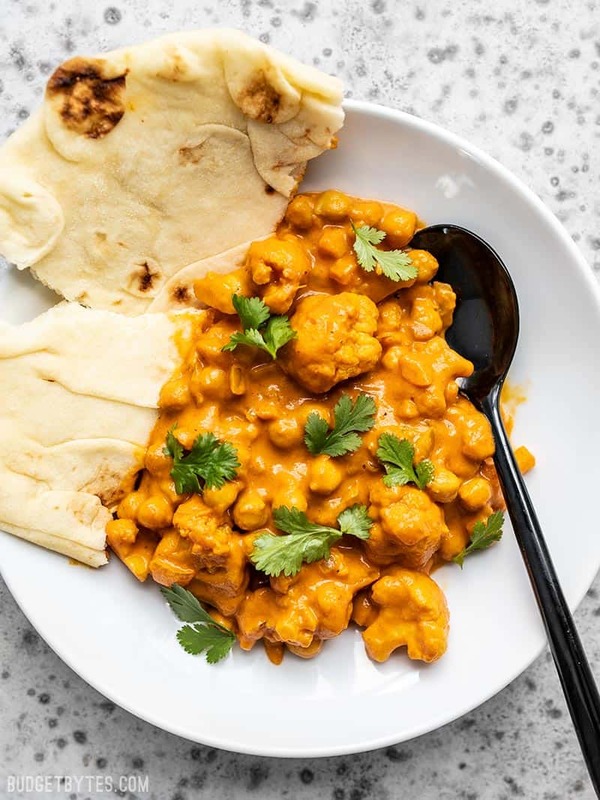 Begin by combining 2 Tbsp garam masala, 1/2 tsp cumin, 1/2 tsp turmeric, 1/2 tsp smoked paprika, 1/4 tsp cayenne pepper, 1/2 tsp salt, and some freshly cracked pepper in a small bowl. Finely dice one yellow onion, mince three cloves of garlic and grate about 1/2 Tbsp fresh ginger (ginger is hard to measure, so this is flexible). 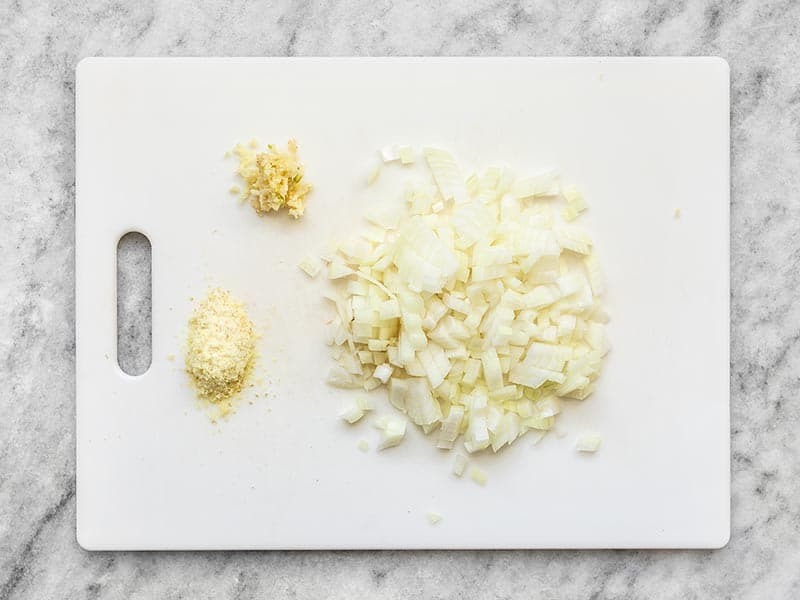 Add the onion, garlic, and ginger to a large skillet with 2 Tbsp olive oil and sauté over medium heat until the onions are soft and translucent (about 3 minutes). Add the spice mix and continue to sauté for one more minute. Add 12oz. 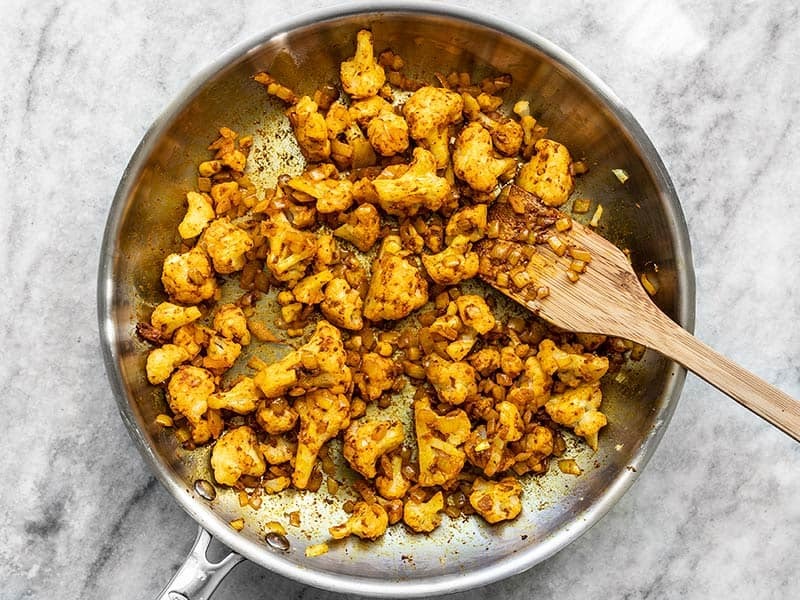 frozen cauliflower florets to the skillet and continue to sauté until the cauliflower is thawed through and coated in spices. Next, add one 15oz. 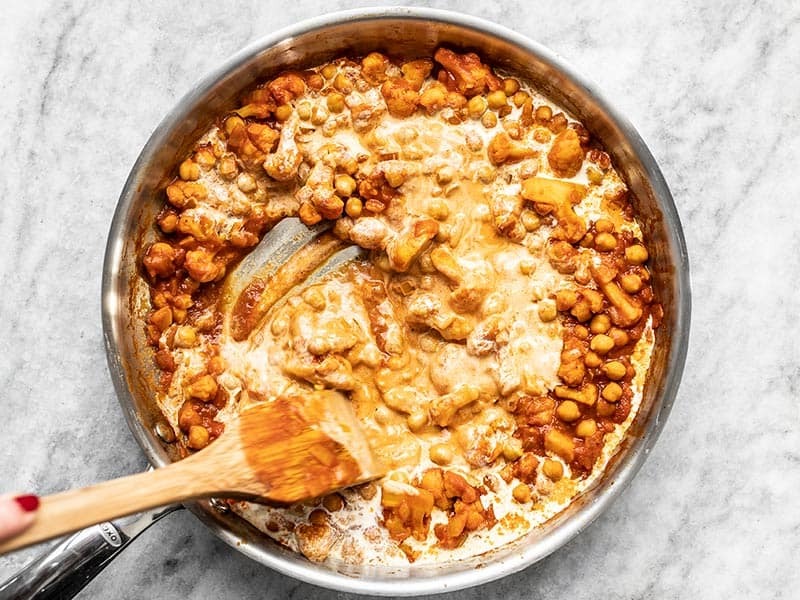 can chickpeas (drained), one 15oz. can tomato sauce, and about 1/4 cup water to the skillet. Stir to combine and then let the sauce simmer over medium-low heat for 15 minutes, stirring occasionally. If the sauce starts to dry out as it simmers, add a couple more tablespoons of water. After the sauce has simmered and the tomato sauce has mellowed a bit, turn off the heat and stir in 1/3 cup heavy cream. After stirring the cream into the sauce, give it a taste and add more salt to taste (I added about 1/4 tsp). I garnished here with fresh cilantro, but didn’t find that it added a lot to the flavor, so that’s entirely optional! Very nice warm, hearty flavors. So nice on a chilly evening. I roasted fresh cauliflower for 30 minutes in a 400 degree oven because there was no frozen cauliflower in my local grocery store. Everything else I did exactly as the recipe said. I love spicy food, but felt there was too much of the garam masala and it overwhelmed everything. Next time I will use 1 Tbl spoon instead of two. Even made the naan bread to go with it. Which was delicious. I would like to use fresh cauliflower. Do I just need to cook it first?